Companies can ensure higher standards when it comes to delivered and procured goods by deploying SAP Quality Certificates, writes Jawad Akhtar. 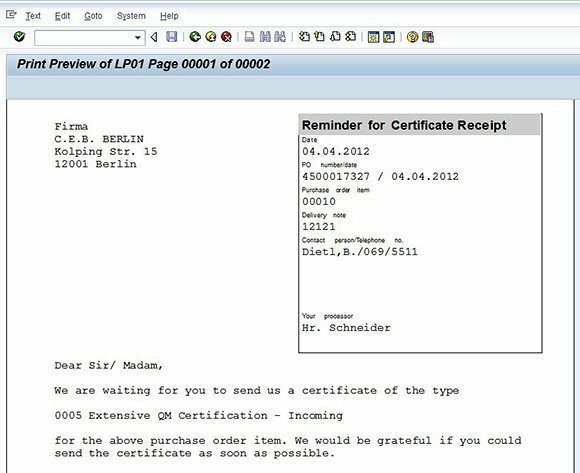 consider integrating quality certificates in the SAP QM (Quality Management) module to bring greater visibility and control to quality-related documentation involved in these two important business processes. Quality Certificates in SAP help validate that a product conforms to predefined specifications. SAP offers two types of quality certificates, namely, incoming quality certificates and outgoing quality certificates. An incoming quality certificate is used to compare and measure incoming goods with a company's quality specifications to make sure they meet those standards. In this process, the company procures material from a vendor and requires the vendor to submit an incoming quality certificate at the time of goods delivery. The incoming quality certificate is a document from the vendor that confirms the supplied material conforms to the company's predefined product's specifications. Outgoing quality certificates perform a similar function for products going out the door. Used in conjunction with the sales and delivery process, outgoing quality certificates document confirm that the delivered good conforms to the customer's specifications. The certificate is delivered at the time the goods are delivered to customer. Can companies get to a better customer-driven supply chain with SAP HANA? The first step towards integrating quality certificates in the procurement process begins when the person overseeing quality management operations assigns a certificate type needed for a procured material. A certificate confirms, for example, if the vendor-supplied material is kosher or halal for food items, or meets industry standards such as ISO or DIN for engineering products. The next step is to put in place the necessary control levels for incoming quality certificate submission. Such control levels can vary from lenient to more stringent error messages that occur if the certificate does not accompany the receipt of the goods. 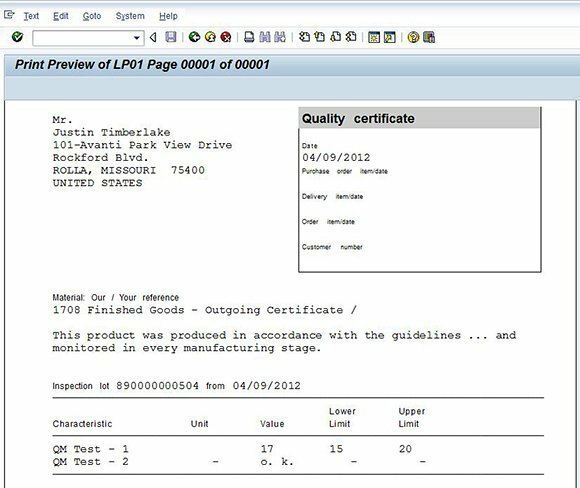 An information message by the system simply informs the warehouse person of a missing quality certificate. An error message will not allow for an official receipt of the goods in question until the vendor submits the quality certificate. To bring greater visibility and tracking of incoming quality certificates, there are a few statuses the warehouse person can use to reflect where the certificate is in the process, or if it's been received. Some of these statuses are certificate expected, certificate filed and inspected or certificate is defective. There are two additional system's statuses -- either a reminder of certificate sent or a more urgent certificate receipt escalated -- that the system automatically sends to the vendor who has not yet sent a quality certificate. There are instances when the company agrees with vendor to submit the incoming quality certificate within an agreed grace period, like within three days after goods delivery, for example. This may be the case when results of few chemical tests take longer to become available and it correspondingly takes the vendor more time to submit the requisite quality certificate. If the vendor fails to submit quality certificate within the agreed-upon grace period, the system sends a reminder message to vendor on the missing quality certificate. Figure 1 shows a reminder message to vendor for certificate submission. Figure 1. Reminder for certificate receipt. If the vendor still fails to submit the quality certificate after receiving a certificate submission reminder, then the next logical step is to escalate it, to reflect the urgency of certificate submission. The urgency is that the warehouse person is unable to issue the vendor-delivered material to production or maintenance processes, thereby disrupting the logistics, maintenance and supply chain functions of the company. As in the case of the incoming certificate reminder message, the system sends an escalation message to the defaulting vendor. In the sales process, the person at the company looking after the quality management operations needs to include the physical outgoing certificate along with the product when it is dispatched to the customer. The next step is to define a certificate profile in the system consisting of the inspection results of physical and chemical attributes of the product. For example, if the company conducts inspections on ten different physical and chemical attributes tests on its product, but wants inspection results of only five of these to appear in the outgoing quality certificate to customer, then these five attributes become part of certificate profile. The quality inspector conducts a quality inspection on the product consisting of various tests and eventually records the actual results in the system. The quality inspector prints these actual inspection results on the outgoing quality certificate. This printed outgoing quality certificate is in fact the actual physical document that the company sends to its customer with each dispatch of goods. Figure 2 shows an outgoing quality certificate of a product. Jawad Akhtar is the author of the SAP PRESS book Production Planning and Control with SAP ERP. He is the head of SAP delivery in Abacus Consulting, where he focuses on logistics and SCM issues.